In Temple times, ritual impurity was extremely important, especially in and around Jerusalem. The Torah warns that a person who is ritually contaminated “and does not cleanse himself, defiles the tabernacle of the LORD, and that person shall be cut off from Israel” (Numbers 19:13). Therefore, it became critical that a person know if there was a potential of becoming ritually contaminated or not, so that he could take steps to avoid it. 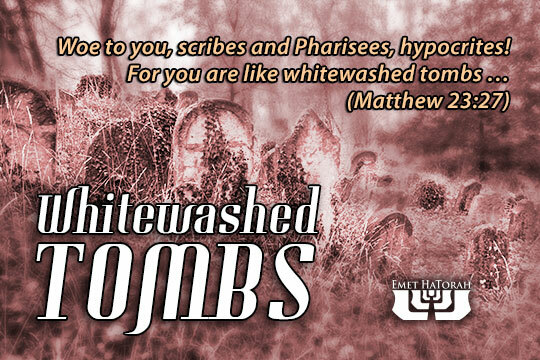 Please bear in mind, however, that he was not talking about the scribes and Pharisees as a whole. In the midst of his most scathing rebuke against the Pharisees he reminds his disciples that they wield legitimate legislative authority over the interpretation and application of Torah—they “sit in the seat of Moses”—and are to be obeyed. However, his rebuke is entirely against their hypocrisy and warns his disciples against such duplicity in their behavior. If we are pursuing the LORD wholeheartedly, we should take every effort to avoid hypocrisy on our journey. We should constantly ask ourselves if our actions reflect what is in our hearts, or if they mask what’s behind closed doors. As disciples of Yeshua we should be bearing the fruits of righteousness through our deeds. But our deeds should never be a smoke screen for our hypocrisy. They should be a genuine reflection of the transformation that has taken place within all who have encountered the Rabbi from Nazareth.